During the construction of submerged crossings, the raised demands are placed on the quality of executed works and used materials and technologies. 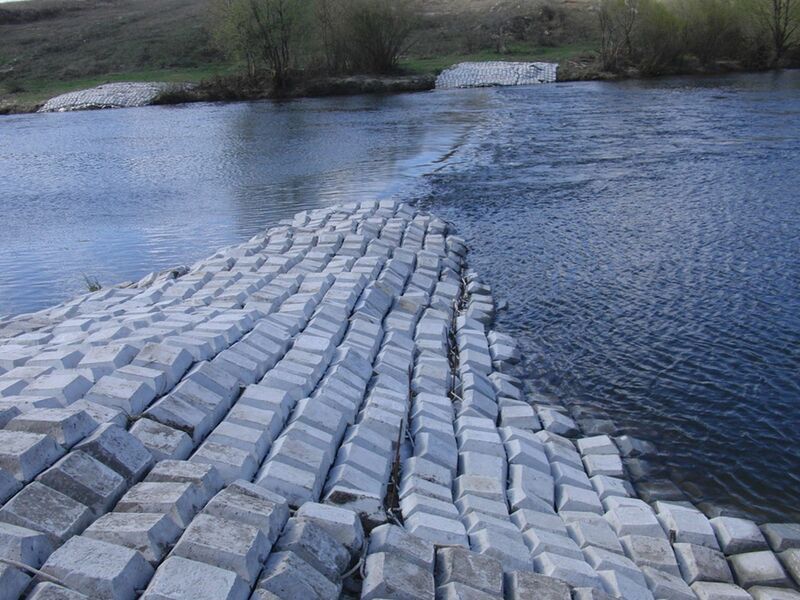 That is why, the designers and constructors of submerged crossings shall apply technologies, ensuring reliable, efficient and fail-safe crossing operation during a long time period, without making harm to the environment. Universal flexible protective concrete mats (UFPCM) became one of such technologies, made, as a matter of fact, a small revolution in the piping protection methods. 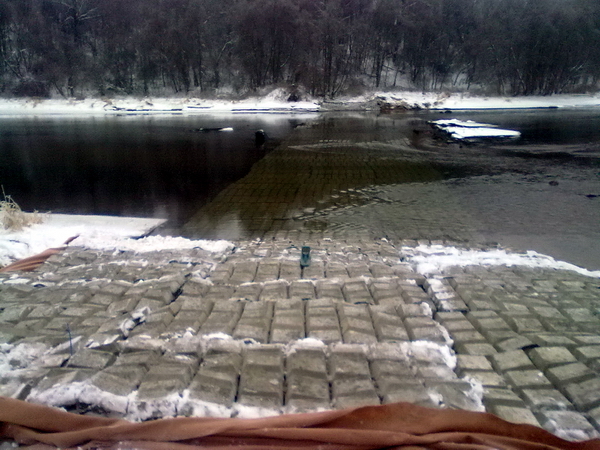 The structure of flexible concrete mats (UFPCM) was designed in the end of 90s by the specialists of CJSC Peter Diving Services, Voronezh, specialized in major overhauls and instrumental surveys of submerged crossings. This design allowed making the principal new process of their laying at repairable portions. Instead of heavy hand labor for the alignment of macadam banket or underwater laying in cement mud clouds of bags with cement-sand mixture, a diver transforms into a submarine strapper-wireman, only orienting and connecting a mat (UFPCM) underwater. Being inter-fastened with the help of brackets or inter-bound by a rope, the mats (UFPCM) form a uniform concrete blanket, reliably opposing water flows and floating matter. As opposed to gabions, requiring the macadam availability in the site, laborious and meticulous works for laying meshes, their fastening and filling with macadam, mats (UFPCM) are delivered to the site as an already ready product, non-requiring additional assembly and completion. Moreover, made in plant conditions at the enterprise certified in the Gazprom system with an internal quality management system, confirmed by laboratory tests and sanitary certificates, the mats (UFPCM) comply with the highest safety and strength requirements. The whole service life of flexible concrete mats (UFPCM) is comparable to the service life of the piping itself. 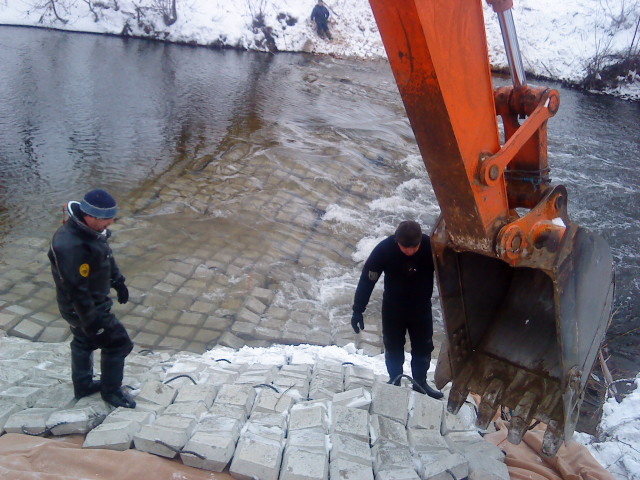 Sometimes, the construction of protective structures over a pipe with finishing the protective layer up to the rates, required by the Gazprom standards, leads to the occurrence of an artificial obstacle in the riverbed. This has a negative impact on the hydrodynamic processes. 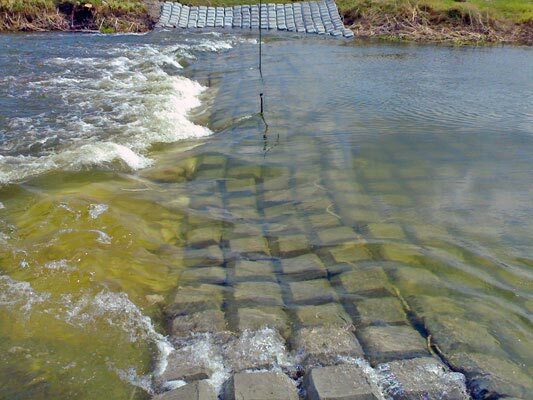 Passing through the protection of mats (UFPCM), a water flow bypasses the protected portion of submerged crossing enough smoothly, without the formation of vortex, swirl areas. Moreover, due to its cell structure, mats (UFPCM) do not preclude the rooting of water and coastal plants, thereby being strengthened by driven bottom soil and plants. But what about the economic feasibility? Then it is one of the main parameters during the selection of one or another solution, and the main thing is the project cost. It is clear that, in comfort conditions of the design and estimate department, many questions of processability, site delivery and laying ease seem to be insignificant. At the first sight, the cost of gabions in terms of 1 square meter of the protected portion occurs to be lower than the cost of mat protection (UFPCM). But it is only at the first sight… After the objective economical survey of all labor costs, non-productive expenditures, diver operation speed during laying and, respectively, of the work terms, the costs can be compared. And the main factor – service life of mat protection (UFPCM) shall be considered. By the manufacturer warranty, it equals 15 to 100 years depending on the laying place. as opposed to solid concrete pipe covering, it avoids the increase of its rigidity and, therefore, the increase of minimal curvature radius during its laying as well as the considerable labor intensity of complete covering application is eliminated thereby. Besides, flexible concrete mats (UFPCM) are easily demonstrated and re-laid in case of necessity in repair works of the piping itself. All this gives the possibility to reduce the construction and operation cost of a submerged crossing, increase the work reliability and considerably increase the operation life of a submerged piping, which in case of qualitative project execution and construction monitoring will be equal or will exceed the designed operation life of the whole pipeline.